Chikara Shotokan Karate Academy would like to congratulate 3 of their younger members in obtaining their Black Belts. Hawarden’s William Oakland, Emma Evans & Alex Hill all attended at the dojo based in Hawarden High School on Sunday 10th April 2011 where they took part in a dan examination. All 3 showed off their talents in front of a grading panel of 4 senior grade instructors. Having completed their grading they were all awarded shodan by Shihan Ian Smith 6th Dan (KWF). CSKA would like to congratulate them on their achievement and hard work so far…. 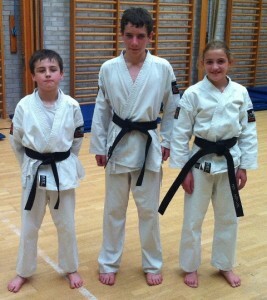 Congratulations to the three new black belts at Hawarden. Well done! Good luck to everyone taking their grading this Sunday 3rd July.